Our sheet pan roasted brussels sprouts is a reader favorite! It’s loaded with bacon and garlic. First of all, there’s so many sheet pan roasted Brussels sprouts recipes that get passed around as favorite Thanksgiving or holiday appetizer side dishes. From different variations like adding dried fruit, cheese and nuts it’s hard to decide what to make. From our test kitchens, we’ve found that an all around favorite and easy brussels sprouts recipe is simply with bacon, garlic and balsamic vinegar. That’s what this sheet pan roasted brussels sprouts is all about, a future holiday favorite for your family. 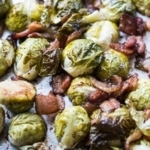 Finally, it’s the best brussels sprouts recipe for bacon lovers! All roasted in one pan, this sheet pan roasted brussels sprouts is super delicious and the bomb! 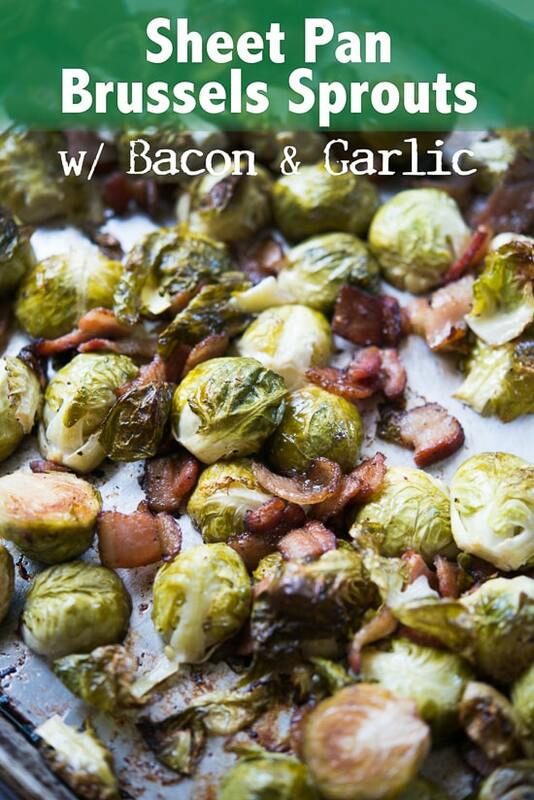 It starts with crisp bacon, fragrant garlic and slowly caramelized brussels sprouts by being baked in the oven. And oh, a little bit of balsamic vinegar as well to add a bit of acid and tang. Voila! 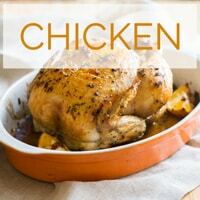 What you get after about 40-45 minutes in the oven is an amazing side dish that’s fragrant and delicious. 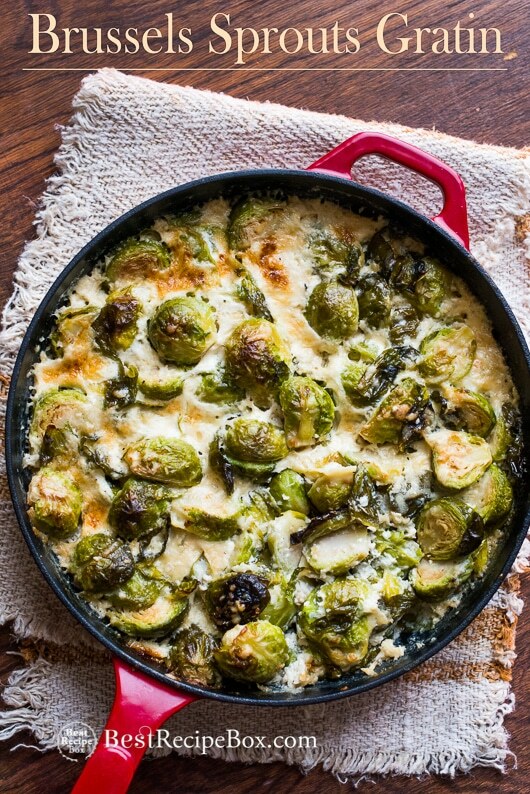 This just might be the brussels sprouts dish to bring all haters to lovers. 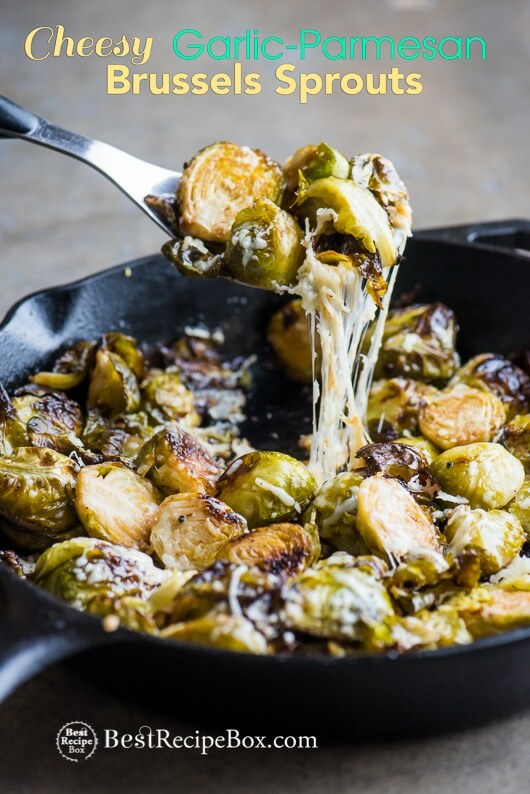 This is going to be one of your favorite sheet pan roasted brussels sprouts. Remember, all brussels sprouts vary so much in size and it’s hard to really pin point the most consistent cooking time. You’ve gotta play it by ear when you cook them in the oven. 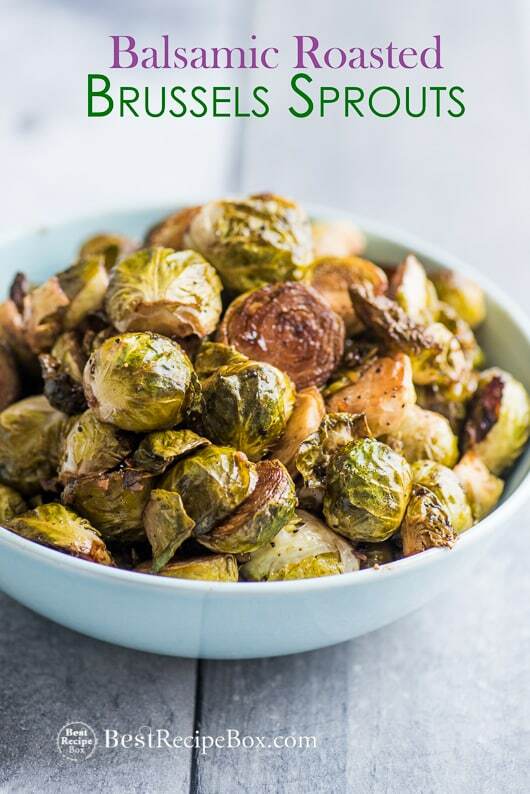 Best advice we can give you is to make sure to choose all the brussels sprouts to be the same size when you buy them because if they’re all the same size, you’ll have consistent cooking for the whole batch. 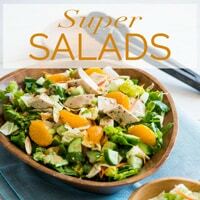 These are the perfect and easiest Thanksgiving side dish that everyone will love. Another option to make it extra delicious is to add some freshly grated parmesan cheese on top when you take them out of the oven and while they are still warm. Finally, that’s an amazing addition that you can’t go wrong with. Enjoy! 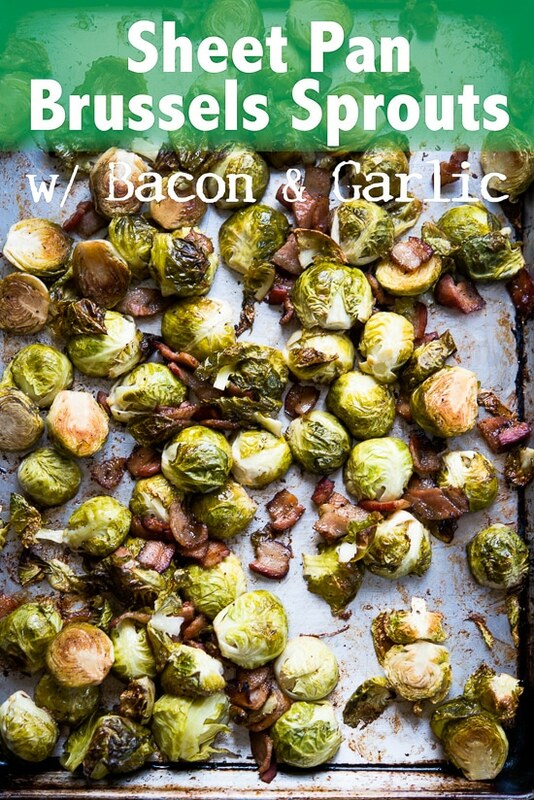 Watch Video: Sheet Pan Brussels Sprouts with Bacon & Garlic! Brussels sprouts can very a lot in size so make sure to adjust your cooking times . 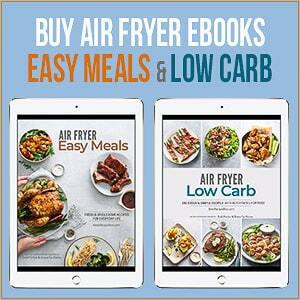 Also, try to select all the same sizes for consistent cooking. Heat a skillet on medium heat. Slowly cook bacon pieces until fat is released, but bacon is still soft and not crisp yet. Remove skillet from heat. Then add minced garlic, balsamic vinegar and stir until combined. 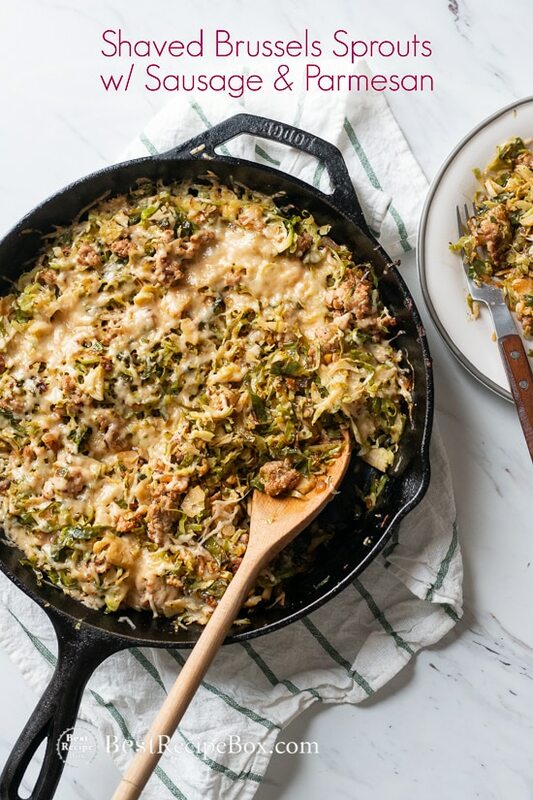 Add brussels sprouts piled in the middle of the sheet pan. Pour bacon oil mixture onto the brussels sprouts. 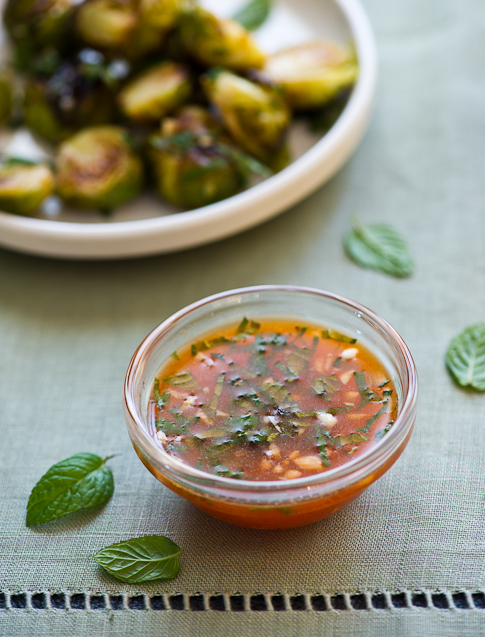 Gently toss until the brussels sprouts are evenly coated with bacon oil. Spread the brussels sprouts into one even layer on the sheet pan. Season with salt and pepper. Roast in oven for about 20 minutes, then gently toss and mix the brussels sprouts. Bake brussels sprouts for another 20 minutes, or until the brussels sprouts are tender and bacon is crisp. 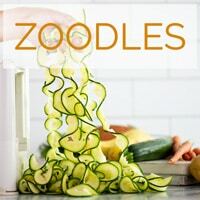 Has there been a correction to this recipe? Lower temp? Less time? I made it exactly according to the recipe and it burned to a crisp; when I opened the oven our smoke alarm went off. Hi Sharon, no there wasn’t any correction or changes to the recipe. Brussels sprouts vary so much in size and that factor definitely changes the cooking time. I absolutely love brussel sprouts! 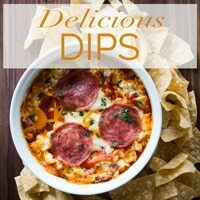 This is a great way to cook these! 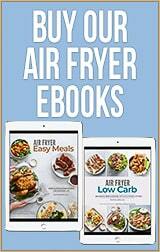 They come out so crispy and delicious. 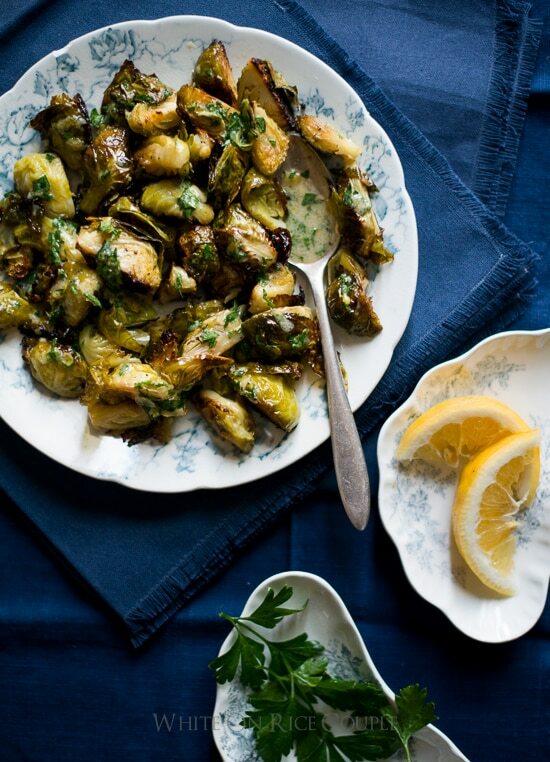 What an easy way to cook brussels sprouts! And I’m loving the bacon & garlic combination with this yummy veggie. 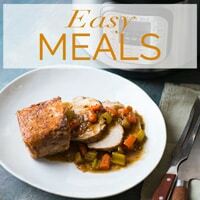 Thanks for the awesome recipe!